The name of the British Foundation for Study of Azerbaijan and the Caucasus has been engraved on the Clarendon Arch. Rector of the Baku Branch of Moscow State University, vice-president of the Azerbaijan National Academy of Sciences (ANAS), head of the Nizami Ganjavi Scientific Center of the University of Oxford (www.orinst.ox.ac.uk/nizami-ganjavi-programme-study-languages-and-cultures-azerbaijan-and-caucasus) from the Azerbaijani side, Chairperson of the Board of Trustees of the British Foundation for the Study of Azerbaijan and the Caucasus (www.bfsac.org.uk), Academician Nargiz Pashayeva has been solemnly accepted as a member of the Chancellor’s Court of Benefactors, led by Chancellor of Oxford University Lord Patten of Barnes. By an invitation letter from Chancellor of Oxford University Lord Patten of Barnes, Professor Nargiz Pashayeva on October 11 took part in the 28th annual special event of the Chancellor’s Court of Benefactors to receive this honorary title. Along with this, a ceremonial execution of the decision, which attracted attention and went down in history of the Oxford University, was held. Thus, by the decision of the management and the science council of the University of Oxford, the name of the British Foundation for the Study of Azerbaijan and the Caucasus has been engraved on a memorial plaque on the arch of the 17th-century Clarendon Building (www.oxfordhistory.org.uk/broad/buildings/south/clarendon.html) as a permanent member of the Chancellor’s Court of Benefactors, along with world-renowned scientists, public figures and authoritative organizations. The University of Oxford has a tradition to constantly promote partners that it values. According to this historical tradition, starting from the 14th century, the names of the most generous benefactors of the university and world-famous people are inscribed on the Clarendon Arch (www.oxfordhistory.org.uk/broad/buildings/south/clarendon.html) at the entrance to the famous Bodleian Library (www.bodleian.ox.ac.uk), the building of prime importance, which is considered the heart of the university. This building was built in 1711-1715 by Nicholas Hawksmoor. The building was originally intended for the Publishing House of the University of Oxford. Now a part of the Bodleian Library is located here. The Clarendon Building is at the forefront of the list of historical buildings registered in England. As a part of the building was financed by Lord Clarendon, the building was named after him. So far, the names of the most prominent philanthropists have been inscribed in the Clarendon Arch. It includes the names of the most famous personalities in the history of Oxford University and the world - Sir Thomas Bodley, Elizabeth I of England, John Radcliffe, William Camden, Charles I of England, Elias Ashmole, George I of Great Britain, George Aldridge, Joseph Bowden, Ann Kennicott, Sir Robert Taylor, John Hall, Charlotte Sutherland, John Ruskin, Rebecca Flower Squire, Christopher Evan Welch, Henry Wilde, The Rhodes Trust, The Rockefeller Foundation, Sir Arthur John Evans, Ford Foundation, Bernard Sunley Charitable Foundation, as well as Transportation Institute, Action Research, Cancer Research UK, Fereydoon Soudavar, and British Petroleum. It also includes the names of 230 prominent scholars, public figures and authoritative organizations, perpetuated on a memorial plaque, including such celebrities as the Weston family, Professor Richard Diebold Jr., Sir Ronald Cohen, Leonard Blavatnik. Professor Nargiz Pashayeva became the first Azerbaijani admitted to the Chancellor’s Court of Benefactors, consisting of scholars, public figures and reputable organizations with special achievements in the history of the University of Oxford, which according to the latest ratings is considered the leading high school in the world. A special mantle and a hat of the University were presented to Nargiz Pashayeva. This honor is given to scholars with special merits in the history of the University. This testifies to the assessment given to the work of Professor Nargiz Pashayeva and the activity of the Nizami Ganjavi Scientific Center, created on her initiative at the University of Oxford. According to the protocol and tradition, the individuals admitted to the Chancellor’s Court of Benefactors are distinguished from other members by special clothing decorated with gold threads. Thus, the contribution of these members to the academic fields in the University of Oxford is recognized by the University with great respect. The traditional annual meeting of the Chancellor’s Court of Benefactors gathers the most prominent and loyal friends of the University of Oxford. At the event, new members are admitted to the Chancellor’s Court of Benefactors and a number of important research projects are demonstrated. On this day, the names of the most reputable scholars, philanthropists and organizations, as mentioned above, are inscribed on a memorial plaque. Presentations on topical issues by famous scholars are heard, discussions are held with the leadership of the University. By tradition, this year a special ceremony was held in the Divinity School building. 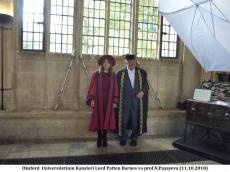 Along with well-known scholars and intellectuals, a mantle and a hat were presented to Nargiz Pashayeva as a scholar who has merits in the history of the University of Oxford. Then, the members of the Chancellor’s Court of Benefactors and other participants of the ceremony met with Chancellor of the University of Oxford Lord Patten of Barnes and posed for photos. The 28th annual meeting of the Chancellor’s Court of Benefactors was held at the famous Convocation House, where the UK Parliament gathered in the 16th century. At the beginning of the event, a ceremony was held to admit new members to the Chancellor’s Court of Benefactors. According to the traditions of the University of Oxford, passing through the Wren Door and the Chancellor’s Court, new and existing members of the Chancellor’s Court of Benefactors upon the corresponding procedure solemnly entered the Convocation House from the Divinity School building. After Marshal, Chancellor of the University of Oxford Lord Patten of Barnes, Proctor, Senior Proctor, Junior Proctor, Vice-Chancellor, Proctor Secretary, the current members of the Chancellor’s Court entered the old ceremonial hall. Among them were Dr. Chung Hon-Dak, Peter Levin, Dr. Kotaro Ono, Sir Howard Stringer, Dr. Robert Easton, Professor Raymond Dueck, Marina Marks, Bernard Taylor, Professor Chas Bountra. After the current members of the Chancellor’s Court of Benefactors, along with Professor Nargiz Pashayeva, new members entered the hall. Among them are Sultan Nazrin Muizuddin Shah, Sir Peter Luff, Sir Martin Smith and Lady Smith. This year only three names have been engraved in the Clarendon Arch. One of them is the British Foundation for the Study of Azerbaijan and the Caucasus, chaired by Professor Nargiz Pashayeva.